@BifBangPow: Get your GEEK on, brothers and sisters! Get your GEEK on, brothers and sisters! Hey gang, Lenzi here again, continuing to spread the good gospel of Bif Bang Pow! Our friends over at GEEK Magazine have once again had the good will (and, let's face it, good taste) to feature one of our fun products in their latest issue. 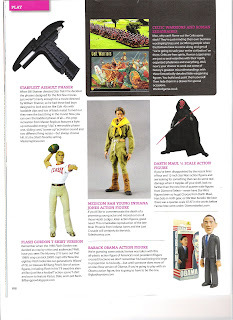 In the PLAY section (naturally) of the October issue, you'll find the new action figure of Flash Gordon, quarterback, New York Jets, about to throw a pass to the best dressed presidential candidate since JFK, Senator Barack Obama. Ironically, or perhaps not, GEEK says that Alex Ross himself should design a new Obama action figure. Hey, doesn't he design the 'Flash Gordon' figures we make? He does! Man, we gotta get these two kids together! GEEK is sold at all good news stands and book stores around the country, and if your local DOESN"T carry it, insist that they do. It's the coolest new mag out there, and is always full of pop culture goodness to keep us all in tune with the latest happenings. Thanks again GEEK, you make us proud! P.S. Oh yeah, and um, get out and VOTE America! !